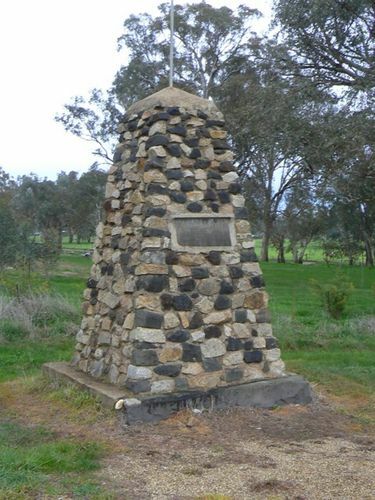 A monument commemorates the Hume and Hovell expedition of 1824. North-Eastern Victoria is celebrating this week the centenary of the discovery of the Murray on November 16, 1824, by Hamilton Hume and Hilton Hovell. At Albury (N.S.W.) a festival week is being held, which has attracted many thousands of visitors. A party, headed by Sir James Barrett, of Melbourne, and including Mr. W. R. Hume, a descendant of Hamilton Hume, and his family, is assisting in the unveiling of about 40 memorial tablets along or near to the tracks blazed by Hume and Hovell. The first tablet was unveiled at Mt. Buffalo, discovered by the explorers on November 25, 1824. At Whorouly, in the Oxley Shire, a tablet was unveiled to mark the spot on which the explorers crossed the Ovens River. At Everton a roadside cairn was unveiled, and another at Murmungee, just below the Buckland Gap, between Everton and Beechworth. On the way into Albury, the party which is unveiling the memorials stopped to pay homage to the Hovell tree, which still stands as a living monument to the memory of the explorers. They arrived at that tree on November 17, 1824, and Hovell cut his name into the trunk. Australasian (Melbourne), 22 November 1924.